The Church will spare no effort to do all that is necessary to bring to justice clergy who have committed abuse crimes, Pope Francis told members of the Curia in Rome yesterday during their annual Christmas audience. In an overview of the highs and lows of the year, the Pontiff used strong words to address the “wound of abuse”. The Pope said there were many consecrated men who abuse the weak, taking advantage of their own moral power and persuasion. “Let it be clear that before these abominations the Church will spare no effort to do all that is necessary to bring to justice whosoever has committed such crimes. “The Church will never seek to hush up or not take seriously any case,” the Pope said. 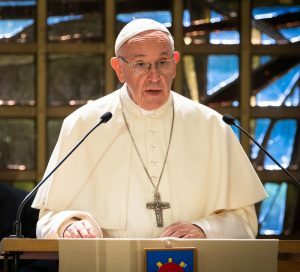 Referring to the conference in February 2019 on the Protection of Minors in the Church, Pope Francis said there the Church would question itself, guided by experts, on how to protect children in order to transform the errors into opportunities to root out this wound, not just in the Church but in society. Some people accused the media of ignoring abuse in wider society and of seeking to give the false impression that it only affects the Catholic Church, said the Pope. For his part, he offered his “heartfelt thanks to journalists who were honest and objective and sought to unmask these predators and to make their victims’ voices heard”. The Holy Father appealed to members of the Roman Curia to help the Church “in her difficult task of recognising real from false cases, accusations from slander, grievances from insinuations, gossip from defamation”. Meanwhile, in the run-up to the February meeting on the Protection of Minors, the conference’s steering committee has written to all of the Episcopal conferences of the world, including Archbishop Eamon Martin, President of the Irish Episcopal Conference, asking them to prepare for the important meeting by learning first-hand the suffering that victims have endured and to meet survivors of abuse. “Absent a comprehensive and communal response, not only will we fail to bring healing to victim survivors, but the very credibility of the Church to carry on the mission of Christ will be in jeopardy throughout the world,” wrote the steering committee, led by Cardinal Blase J. Cupich. In the letter, dated 18th December, the committee said the first step to healing must be acknowledging the truth of what has happened.